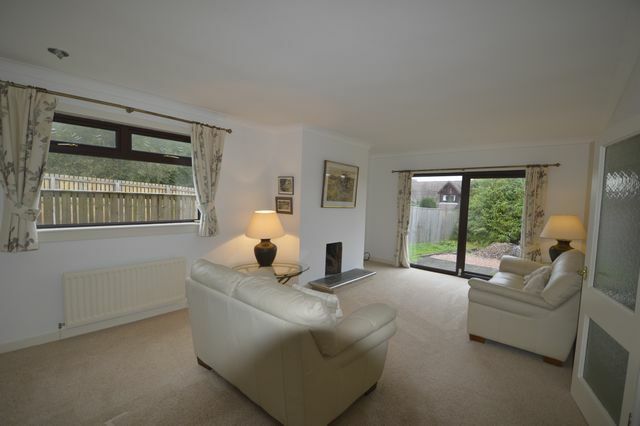 Well presented and excellent family home in a very desirable local. The property consists of a large open hallway, with open plan lounge/dining/kitchen. This room sweeps round in a traditional L shape with each section being clearly defined. The living area has neutral decor and cream carpeting with large patio doors to the front.The dining area has laminate flooring and neutral decor with a large window over looking the back garden. The kitchen are has a selection of units, with in built oven and hob, and fridge and washing machine. There is direct access to the back garden from the kitchen. There are 3 very good size bedrooms, master en suite, all with good levels of neutral decor and neutral carpets. The family bathroom has a 3 piece white suite and is tiled. The property has oil filled central heating and large private gardens. Torwood is a small village nestled between Larbert and Stirling and providing great access to the central motorway network and the Forth Valley Hospital. Landlord Reg: Awaiting EPC: Pending.